After the success of the first Financial Empowerment Workshops for Women By Women we can announce the date for the next workshop is now set. A workshop for women (run by women) where we explore why we feel like we do with money and why we may make decisions that aren’t always good for us. We provide some basic financial literacy skills to help you navigate your budget, superannuation, life insurance, tax, debt and estate planning. We work on how you might go about sorting things out and planning for your future (financially). 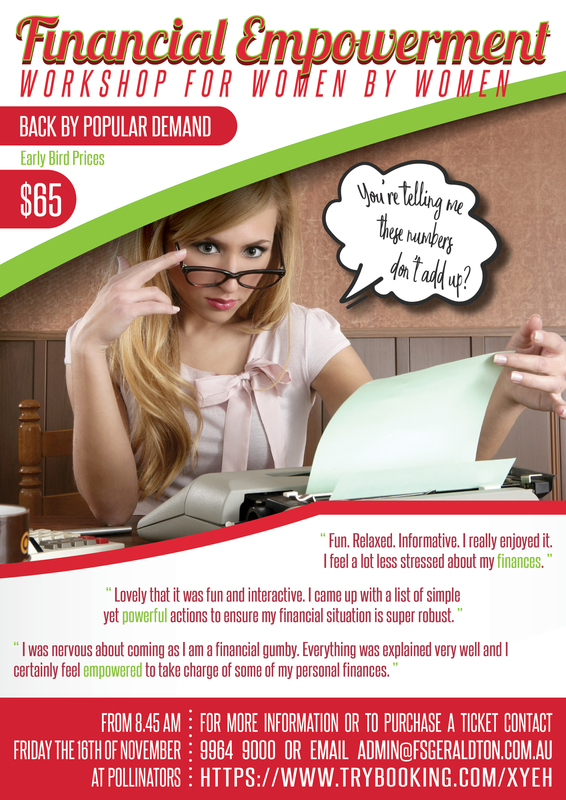 It’s really designed to empower women to feel confident (and not stressed) about money! This workshop is being held on the 16th November, from 8.45am to 2.45pm at Pollinators on Marine Tce. The contents of this Bulletin are general in nature. We therefore accept no responsibility to persons acting on the information herein without first consulting us.